1. Put 250g peeled and cubed bramley apple (about 3 medium apples), 1 tbsp honey, 1 tsp ground cinnamon, ½ tsp ground ginger, and a good pinch each of freshly grated nutmeg and salt in a pan over a low heat. Cover and leave to cook for about 4-5 minutes until the apple begins to soften (add a splash of water if it looks dry). 2. Set aside ½ the apple mixture; lightly mash the rest in the pan using the back of a fork. 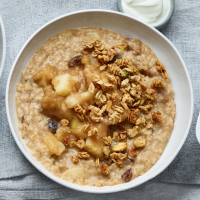 Add 70g porridge oats, 300ml oat drink (or whole milk), 50ml water and 40g sultanas to the apples, and cook gently until the oats are soft and to your desired consistency – about 7-8 minutes. 3. Divide between 2 bowls; top with the remaining stewed apples and a handful of granola. A little natural yogurt is nice, too.